It would be hard to find a more interesting and passionate Indian cook/restaurateur than Tapan Bose. It would be equally difficult to find more interesting or better prepared Indian food in our humble burg. Unfortunately, it’s way too easy to find a seat in this place. Which is a shame because a nicer, more comfortable, attractive Indian restaurant you will never find. To find it, pack a lunch, load a camel and bring along a guide, MapQuest, Google Earth, and a couple of gallons of water, head to the far Southwest part of town, peer into every shopping center on the corner of Durango and Warm Springs until you spot a modest sign in the deep corner of one of them (on the NE side), and then pull right up to the front door. Walk in and Mr. Bose himself will seat you and explain his healthy (no ghee, minimal oils allowed) cooking philosophy and patiently walk you through his entire menu. He will have time to do this of course, because you’ll probably be sharing the place with at most three or four other people. The food will then show up right on time. One bite and you’ll be convinced you’re in the Indian restaurant you’ve always longed for: one where deep, complex flavors fascinate your palate with their roasted spices and soulful heat. Bose’s Aloo Tikki is a case in point. It is a fried potato cake flecked with peas and cilantro leaves that bursts with the flavor of all of them as it hits your tongue. The sweet/hot tamarind sauce swirled on top is also a revelation in sweet, heat, tangy and tart and yet another reason you’ll wolf these down while anticipating the courses to come. Chicken Tikka Masala is on every Indian restaurant menu in the world, but here it attains a depth (and long lasting heat) that make other versions pale in comparison. Likewise, the oven roasted fish (Bose called it a sea bass, but it was cut and had the texture of kampachi (farm raised hamachi/yellowtail) to these eyes and teeth) — dusted with coriander, cumin, garlic and ginger — is a superior piece of pisces. It was also pretty hard to find fault with the Dewane Handi (a seven vegetable puree) or the fluffy “bullet” nan (speckled with green chiles and cilantro). 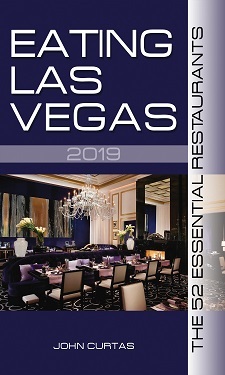 If this place survives its doubling in size in the past year (a big mistake — see previous post), there’s no reason it can’t attain the status of first among equals among Vegas’s growing number of Indian restaurants. Having a passionate owner makes all the difference in the world. For two other takes on this place (by Slapsey Maxey Jacobson and Mad Man Mancini) click here and here. Our meal for two came to $76.50 + $23.50 tip = $100, with no alcohol. Thanks, John, for the excellent recommendation. My family and I tried Mantra Masala tonight for the first time and we were thoroughly impressed! It is by far the best Indian restaurant in Las Vegas, and I’ve tried them all. The food was fresh, the presentation outstanding, and the service superb. Mantra Masala is now our favorite restaurant in Las Vegas!